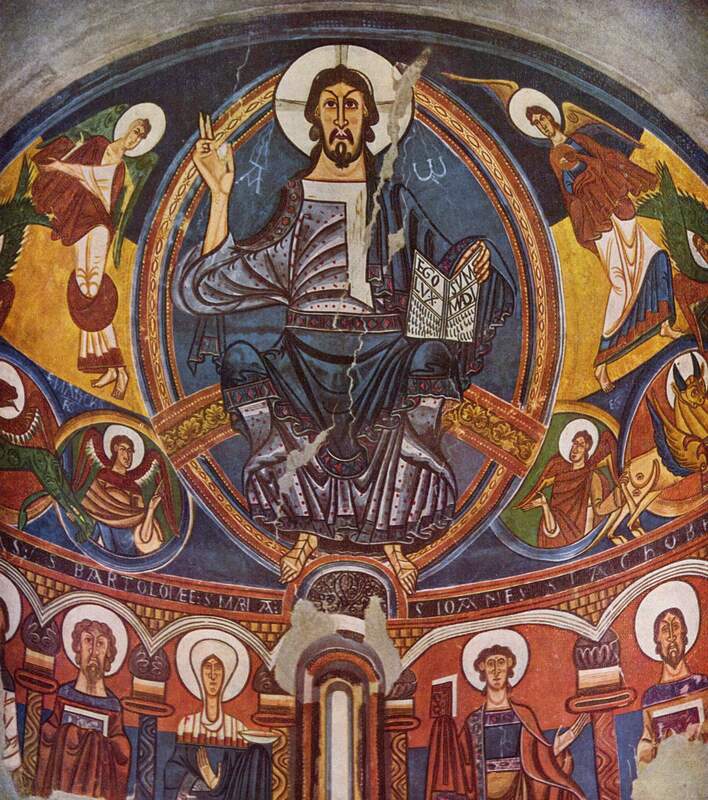 Romanesque paintings abound in Spain. These frescoes can be seen nowadays in the National Art Museum of Catalonia in Barcelona and in the Diocesan Museum of Vich. They can be grouped by their region of origin or by their style. Though all come from the twelfth century, some appear to be older than others perhaps because their authors were inspired in certain archaic motifs. Two main groups of Spanish Romanesque paintings can be distinguished: one from the area of the Pyrenees and western Spain, the other group includes the surrounding region and the bishopric of Vich. The first group includes the churches located in the old barony of Erill, whose paintings are now all housed at the National Art Museum of Catalonia. This group includes the paintings from the churches of San Juan of Bohí, San Clemente and Santa Maria in Tahull, Santa Eulatia of Estahón, San Quirico or Quirze of Pedret, Santa María de Esterri of Aneu, San Pedro of Burgal, San Pedro of Sorpe, San Pedro de la Seu d’Urgell, and Santa Maria of Mur (the last housed at the Museum of Boston). The Stoning of Saint Stephen, fresco from the church of St. John of Bohí (National Art Museum of Catalonia, Barcelona). Frescoes of the Apse of Sant Climent, Taüll. Like the frescoes of St. Mary, Taüll they represent the work of the same master, who painted elongated figures with stylized facial features and excellent color quality (National Art Museum of Catalonia, Barcelona) . This fresco in particular represents a Christ in the Day of Judgement (ca. 1123). The fresco of the Apse of St. Mary, Taüll, from the same master who executed the apse at Sant Climent, Taüll (National Art Museum of Catalonia, Barcelona) . A Cherub, detail of the frescoes of St. Eulalia of Estaon (National Art Museum of Catalonia, Barcelona). Fresco of the south apse of St. Quirico of Pedret now housed at the National Art Museum of Catalonia (Barcelona). Detail of a Seraphim from the fresco that once was decorating the apse of St. Mary of Esterri de Aneu (National Art Museum of Catalonia, Barcelona), late eleven – early twelve century. Detail of the fresco of the central apse of St. Peter of Burgal, now housed at the National Art Museum of Catalonia in Barcelona. In this scene we see the sitting Virgin Mary carrying a chalice, to her right is St. Peter and to her left are St. John the Baptist and St. Paul (XIth century). Detail of the mural paintings from the XIIth century of the church of St. Peter of Sorpe (National Art Museum of Catalonia, Barcelona). The Christ in Majesty from the apse of St. Mary of Mur (Museum of Fine Arts, Boston). By general rule, in these paintings the Pantocrator or Omnipotent is depicted at the apse within the almond-shaped halo, or in some instances was the Virgin seated with the Child in her arms, the figures of Christ or the Virgin were accompanied on each side by angels and seraphim (or also by symbols representing the Evangelists), and when the Virgin Mary was represented at the center, then the Magi were represented beside her in the act of the adoration of the Child. Below the apse and covering the cylindrical wall were the figures of the Apostles and Prophets with their corresponding attributes. These frescoes were painted in intense bright red, blue and yellow colors, in a much more intense range of color than any other Romanesque frescoes found in other European countries. The background of these frescoes were divided into uniform zones of extreme color contrast. From these paintings, those coming from the two small churches of Tahull (particularly those of San Clemente) have been repeatedly reproduced in art history publications. The scene of the Calvary portrayed in Romanesque style was prevalent in several regions throughout Spain. Unique to Catalonia was the scene of the Descent including all of its characters. Another theme typical of the Catalan Romanesque imagery was the Majestat or Christ portrayed on the Cross, crowned or with his bare head and hairs combed in curls falling on both sides of his head; He appears wearing a long robe decorated with storied scenes and with a girdle on his waist. The Batlló Majesty (National Art Museum of Catalonia, Barcelona) from the XIIth century. The Batlló Majesty is perhaps the most representative of a series of polychrome crucifixes, with Christ dressed in robes decorated with oriental motifs. “Majestat” is a Catalanization of “Rex Tremendae Majestatis” symbolizing the triumph of Christ over death. This is a large piece: 1.53 m tall x 1.19 m wide. From the Romanesque period of Catalonia, there is an abundant series of painted wood pieces so rare in all other European countries. These paintings on wood were not isolated icons, they used to be part of the decorative elements of the altar table and were directed right to the front facing the congregation (like altarpieces). The colors were applied onto a paste of plaster stucco, sometimes with very pronounced reliefs, and the coloring were as bright as those applied to the murals. The scenes painted in these altarpieces, or Catalonian antependium*, were also very similar to those of the frescoes: Christ or the Virgin within a halo located right in the center of the rectangle and by their side the Apostles disposed inside horizontal bands. Later on, painters will portray in these frontal pieces the repertoire with the legends of the Middle Ages’ saints: San Martin, San Esteban, San Lorenzo, etc. to whom the majority of the churches were dedicated in those times. In this period there were no great altarpieces placed on the altar, as the priest officiated mass facing the congregation, and thus the front area of the altar table was free, a place that previously used to hold those decorated altarpieces. Usually, on the altar was no more than the cross and candles, and moreover, the presence of painted altarpieces was not necessary because the apses, perfectly visible for the congregation, were covered with frescoes. The wooden front panel pieces painted with stucco were characteristic of the Catalan Romanesque, and reminisce enamels. The wooden front panel from the church of St. Peter of La Seu of Urgel (National Art Museum of Catalonia, Barcelona) presents the twelve apostles staggered on both sides of the Pantocrator sitting within a double halo. The wooden front panel of the Passion, XIIIth century (National Art Museum of Catalonia, Barcelona). Among the many examples of Spanish Romanesque painting it is usually mentioned the great tapestry of the Creation preserved in the cathedral of Girona. On it, overhead, a character that represents the Year is accompanied by four squares framing figures representing the Seasons and the heroic characters of Hercules and Samson. On its sides along the borders there are other squares framing figures that embody the Monthly Labors and the Sun and Moon in their chariots with horses and oxen, respectively. At the center, in a circular arrangement, there are renderings of the Creation with the Demiurge, or beardless Jesus, at the center. The Biblical scenes represented in this tapestry of Gerona were copied from manuscripts’ miniatures, some of which were very old. The Tapestry of Creation, or Girona Tapestry, from the 11th century (Museum of the Cathedral of Girona, Catalonia, Spain). It was probably used as a baldachin for the Altar of the Holy Cross at the entrance of the church. The tapestry depicts a series of theological scenes related to the interpretation of Christian creation. It measures 3.65 x 4.70 m.
Catalonian antependium: A decorative piece, usually of wood in the case of Catalonian antependia), use to adorn the Christian altar and thus it is opposed to the vestments worn by the priest). An antependium hangs down in front of whatever it covers, and is to be distinguished from the altar linens which are used in the service during the Eucharist, and the altar cloth which covers the top of the altar table.